Hey there! 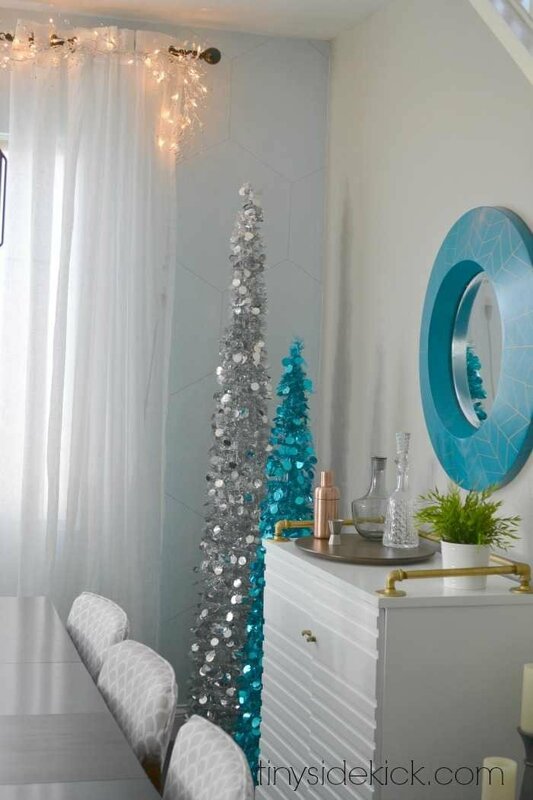 I’ve got a really simple DIY project for you today that is going to add a little sparkle to your Christmas decor! 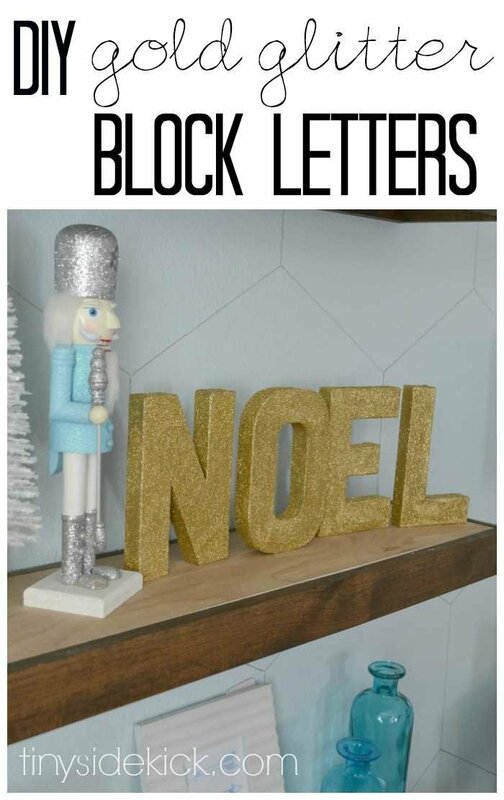 Have you seen the gold glitter block letters in stores? Well that’s what we’re up to today. 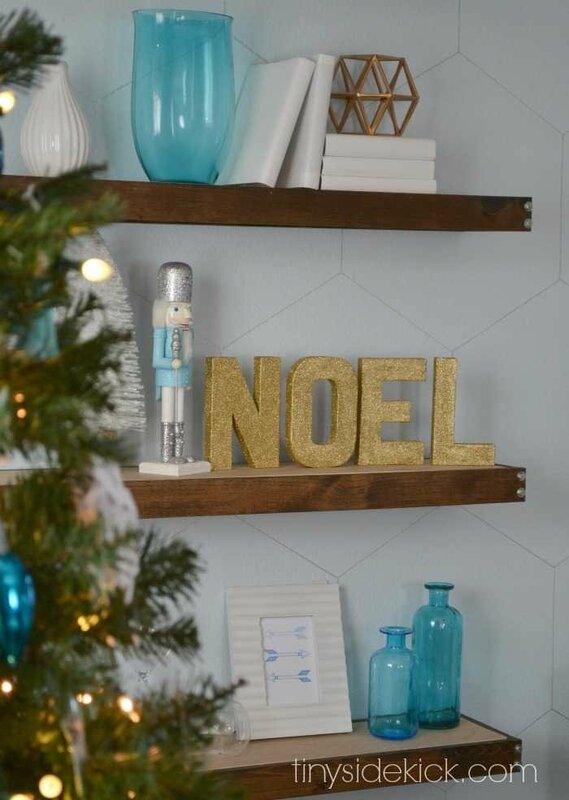 You can make them yourself and that means you get to choose your favorite Christmas word to display. Don’t let the idea of working with glitter scare you off. I have a trick that is going to get that glitter on there real good so you don’t end up with it all over your house. Promise. First you’ll need some block letters to spell out the word or words of your choice. I picked up these cardboard ones at Michael’s but I’ve seen them in wood at various craft stores as well. You’ll also need white school glue, a brush, and some glitter. I used fine glitter. If you use coarse glitter it will have more texture, so it is up to you. I highly suggest that you do this project outside if possible. Glitter is messy. I know, cause after doing this project my husband said I had glitter on my forehead. 🙂 It will end up on the floor just a little bit even if you are really careful. 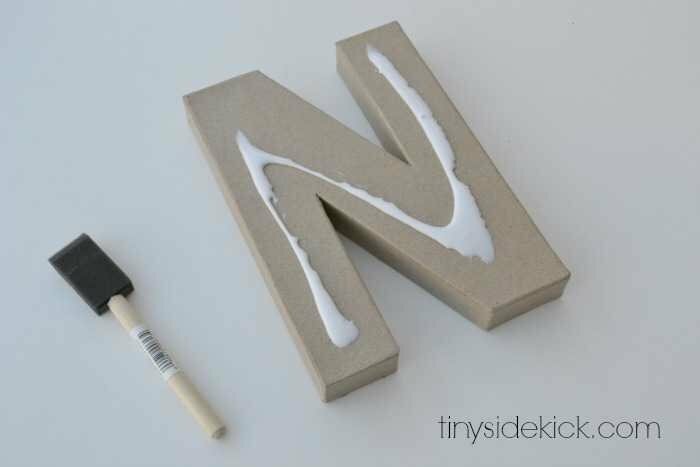 Step 1: I took the lid off of my glue and poured some on the letter. Then I used my foam brush to smooth it out and get it evenly distributed. 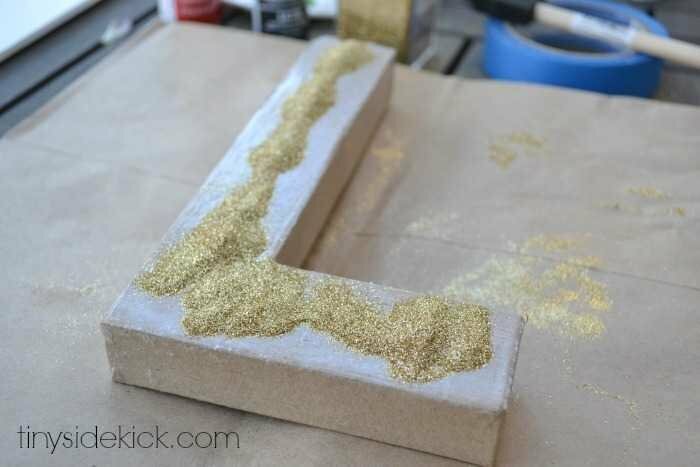 Step 2: Once you have a thin coat of glue on your letter, pour on the glitter. I did this on a paper bag so that I could fold it and dump the excess glitter into a bowl and use it again. I covered most of my letter in glue before adding the glitter. Then I went back and added more glue and more glitter where I needed to. Step 3: Smooth it out with your finger. I found the easiest way to get the glitter on was to dump some on and then smooth it over the glue with my finger. Almost like you are painting it on with your finger. Finally, you’ll want to tap off any excess glitter and add more glue and glitter in the spots that were missed or too thin. Let your letters dry overnight. Now for the trick to keep the glitter from flaking off! 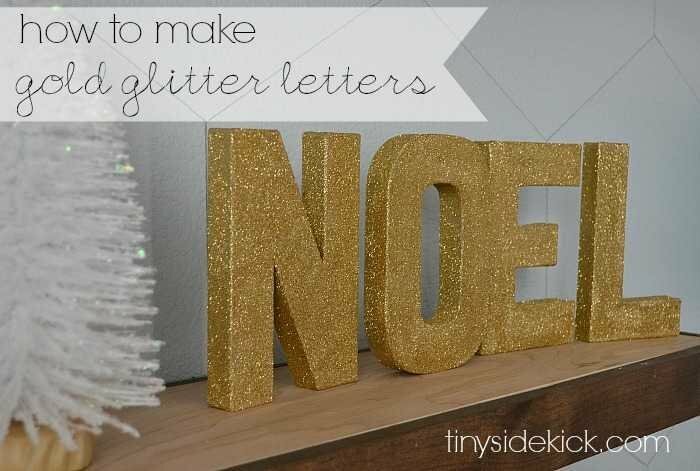 Once your glitter letters are completely dry, spray them with a generous layer of aerosol hairspray. Almost like you are spray painting them with the hairspray. 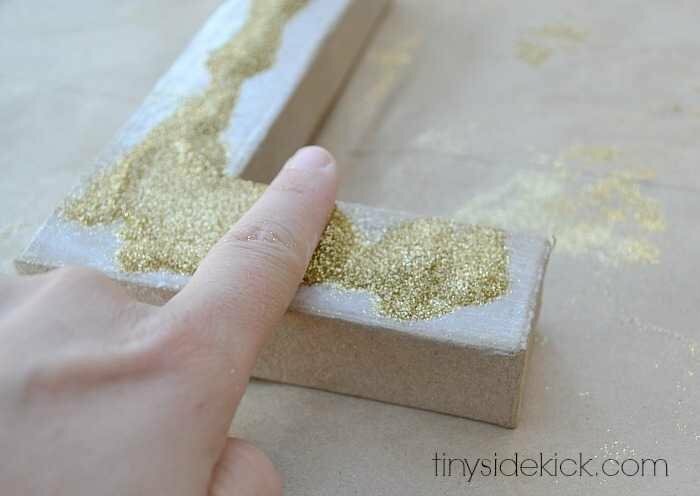 This will act as a glue and keep the glitter from falling off everywhere. 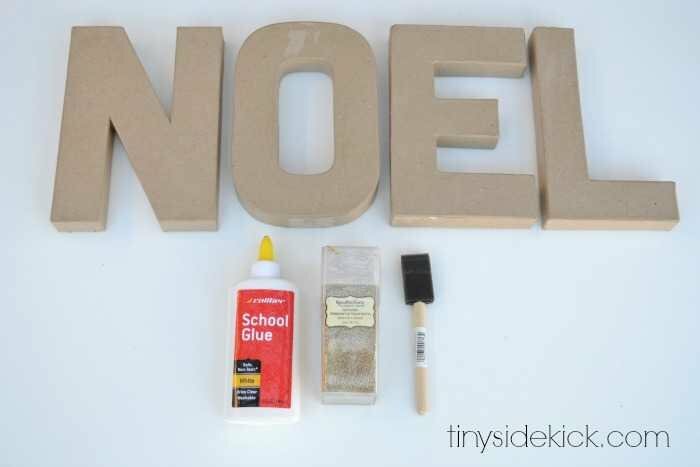 Then let that dry and you’ll have your own custom glitter block letters! What do you think? Pretty easy huh? I’m loving that these ended up being less expensive than the ones I saw in the store and they are a little bit bigger too. What are you crafting this holiday season? Thanks for sharing at the Monday Funday party this week!! Love love love your gold glitter letters! And spraying them with hair spray – GENIUS!!! Thanks so much for the tip. Now I have to go out and get some letters to glitter. I’m so happy to see what you used to keep the glitter on the letters (or whatever else one might decide to glitter up). I’m looking forward to your Christmas Home Tour! So cute! I just saw that you came out with a blog planner! I would love to try it. My goal is to get more organized in 2015. Gasp! This is the PERFECT gift for a little girl I know to make her name out of! I am so exciting! Oh, of course! How could I be so dumb! A very happy Thanksgiving to all of you. Have a wonderful time and rock it like you do. Love. Hi there! We took a week off for Thanksgiving, but I’m so glad you are here anyway! I’m loving the gold too 🙂 And these have added the perfect amount of sparkle. You’re going to love how easy theya are. Have a wonderful Thanksgiving!